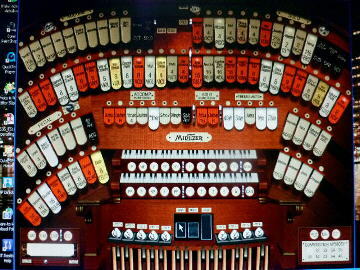 The picture below shows me at the console of the 3 manuel, 12 ranks WurliTzer from the Regal Cinema, Kingston-upon-Thames which is owned by the Brentford Musical Museum. The five clips were recorded there by me in the late 1990s. 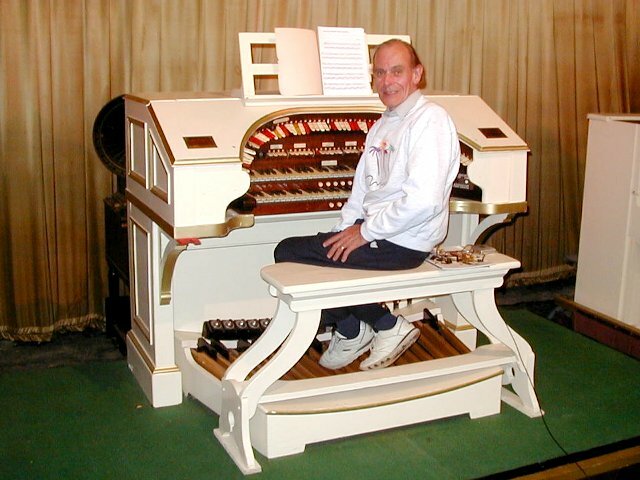 Another organ I played frequently is the 4 manuel, 24 ranks WurliTzer which used to be in the Trocadero, Elephant and Castle, London and made famous by the great Quentin Maclean when he was resident organist. 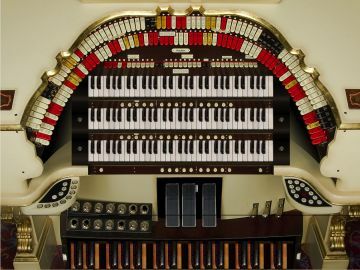 The organ is owned by the Cinema Organ Society and until recently was installed in the South Bank University. It has now been installed in its new venue, The Troxy at Stepney in East London. The pictures below show the console after the 2002 restoration and a view in the pipe chambers. 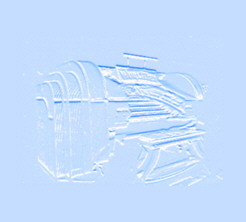 There are five clips of my recordings from 2004. "Puppet on a String" the Eurovision song contest winner. 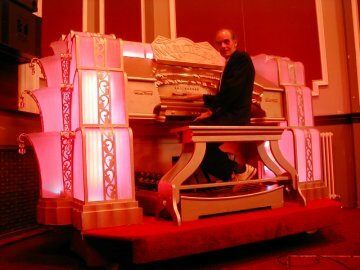 The following video is of me playing Boudleau and Felice Bryant's "Raining in My Heart" on the South Bank WurliTzer. This was a big hit for Buddy Holly. 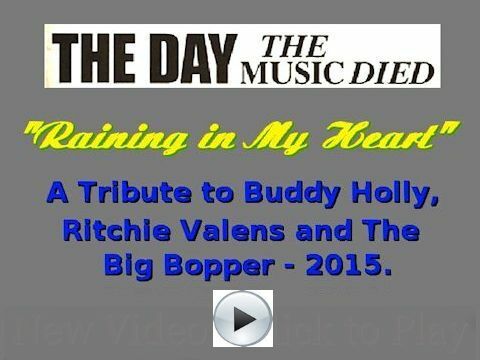 The video is a tribute posted on the 3rd February 2015 on the anniversary of the deaths of Buddy Holly, Ritchie Valens and The Big Bopper in a plane crash near Main, Iowa in 1959. Also killed was Roger Peterson, the pilot of the Beach Bonanza aircraft. Don McLean said "the Music Died" but in fact it lives on. 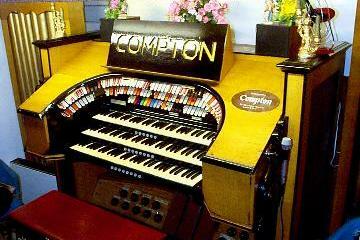 The third organ, that I played a lot, used to be in the Astoria Cinema in Woking. It's a 3 manuel, 6 ranks Compton which until recently was installed in a Southampton residence and used extensively for concerts by the leading organists almost every week of the year. It has now been sold on to a residence in East Anglia. There is one clip from a recording I made there in 1998. At the console of the ex Ritz Cinema, Stockport WurliTzer (3/8) when it was in Clydebank Town Hall near Glasgow. It is owned by the Scottish Cinema Organ Trust and now in Pollokshaws Burgh Hall. The clip is of me playing it in 2000. "A Cup of Coffee, a Sandwich and You"
At the console of the ex Mayfair Cinema, Liverpool Compton (3/7) with Melotone in the Summerlee Heritage Museum, Coatbridge.. The clip is of me playing it in concert in 1998. And a theatre organ in the home? 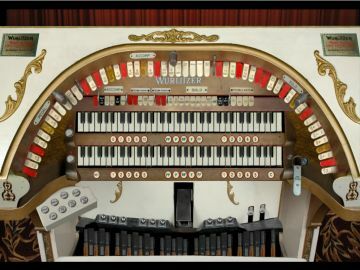 I now have the magic of the Mighty WurliTzer in my home studio thanks to the MidiTzer virtual organ software played from two EMU 61-note MIDI keyboards. Registration changes are via touch screen. 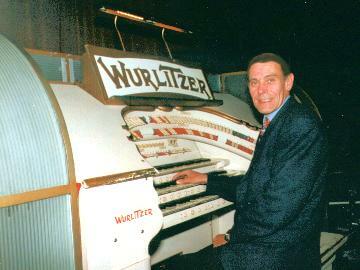 The MidiTzer is modelled on the WurliTzer model 216, two manual organ. Here is a recording made at Christmastime in 2012. All Rights Reserved. 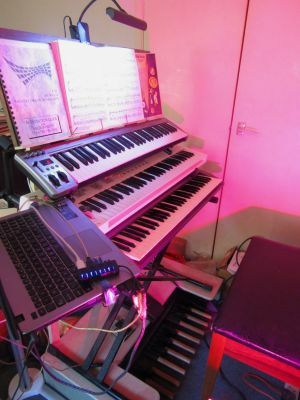 Update in January 2017 The home organ has now been extended with the addition of an Acorn 61-note MIDI controller, a Studiologic 17 note pedal board and the Hauptwerk vitual theatre organs. 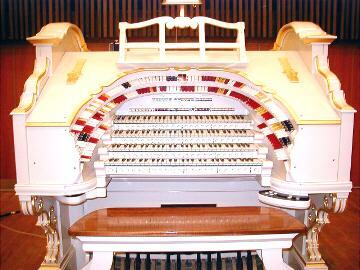 These are the 2/10 WurliTzer from the Virginia Theatre, Champaign, Illinois and the 3/10 WurliTzer from the Paramount Theatre in New York.There is also a very nice classical organ based on that in St. Anne's parish church, Moseley. 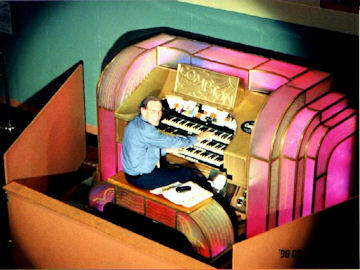 The Cinema Organ Society exists for the benefit of all who are interested in the organ as entertainment. It was founded in 1952 by Hubert Selby. The newly elected President is John Mann and the Chairman is Simon Gledhill. Vice Presidents are John Smallwood and John Leeming. 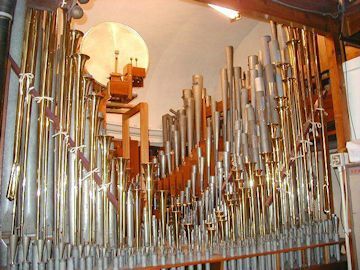 It is based in the UK around four districts; London, Midlands, Yorkshire and Scotland with each one looking after a number of prestigeous theatre organs and organising concerts and other social and instructive events. 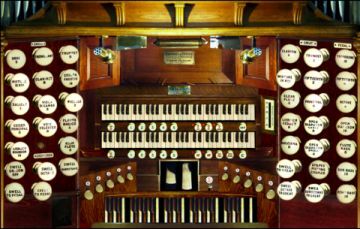 The Theatre Organ Club is the second organisation in the UK for theatre organ lovers. It was founded in 1938 for Robinson Cleaver, the first President. The current president is Phil Kelsall of Blackpool Tower fame. Copyright © 1997 to 2017 Chas Girdwood. All Rights Reserved.